* Start with weaning food according to your baby’s development and begin after the 4thmonth at the earliest and after the 6th month at the latest. Is the baby now allowed to eat the same as the grown-ups? Not quite. Children’s food should be less strongly seasoned, easy to digest and prepared simply. You can, however, start to offer some kinds of family food. The little gourmets will be delighted by the great variety on offer. Early morning: Milk remains the ideal first meal of the day for your child. Breastfeed or prepare some HiPP 3 Milk Formula. This is especially suitable for a baby’s requirements from the 10th month. From the 12th month HiPP Growing-up Milk is suitable for breakfast. If you would rather give your child something solid, HiPP Organic Muesli with Fruits, tasty fruit and fine cereals is an excellent alternative. Your child fancies a bit of bread already? A piece of bread with HiPP Follow-on Milk in a cup makes a complete breakfast. Later morning: It’s best to carry on giving your child cereal-fruit pap later in the morning. HiPP Fruit or Fruit & Yoghurt are practical snacks to take with you for in between meals. Lunchtime: Menus from the 10th or 12th month with small chunks provide everything that your baby needs for a healthy meal at lunchtime. 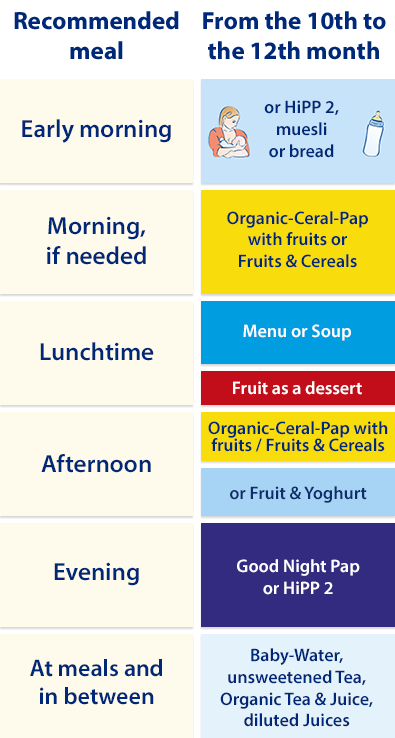 Afternoon: As something in between meals in the afternoon you can continue to offer cereal-fruit pap, HiPP Fruit & Yoghurt or HiPP Fruit Duet. Your child is also sure to enjoy a few biscuits, millet curls, rice cakes or a rusk every now and again. In the evening: Good Night paps in a jar or milk paps to mix yourself are delicious and pleasantly filling evening meals. Rather have some of what everyone else is eating? Then try a piece of bread in combination with HiPP 2 in a cup.